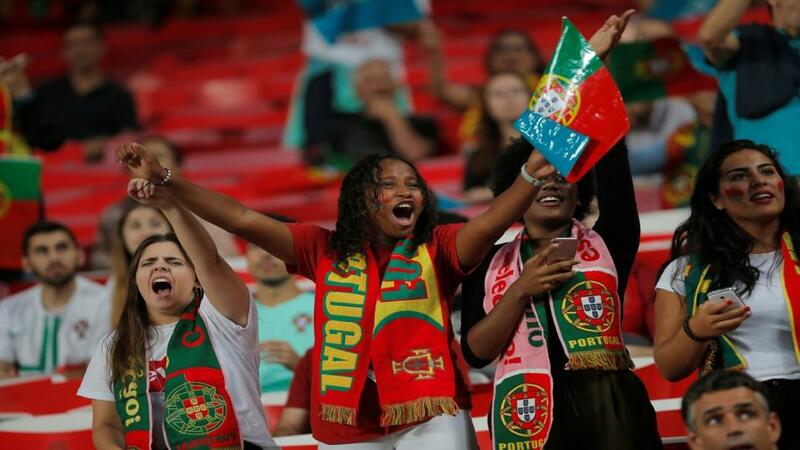 They may have to suffer a bit but these Portugal fans should be celebrating a spot in the Last 16 come 9pm on Monday. Things could get pretty tense for Portugal and with Ronaldo at one end and Iran needing to take risks at the other, we should see both teams scoring, says Jamie Pacheco. Different teams come to the World Cup with different objectives. Clearly, Iran didn't set out to win it but if they came here with the intention of being tough to beat, frustrate the more fancied teams they're up against and do their fans proud with resolute displays, then so far they've certainly achieved that. And then some. They could easily have grabbed a draw against Spain. Their goal was correctly disallowed after intervention from VAR but it was close. And yes, Spain were the better side as you'd expect but they would have rightly have felt hard done-by if they'd lost by more than a goal. Not to mention that Spain's only strike was a fortuitous one. But all that's in the past. Portuguese manager Carlos Queiroz is up against the side he managed over two different spells and knows that in all likelihood he'll have to win to be in with a chance of progressing. For the best part of two decades Portugal played exciting, technical and attractive football. With the exception of a runners-up spot on home soil at Euro 2004, it got them nowhere. Now they're playing a completely different brand of football that's part Jose Mourinho win-at-all-costs, part Greece class of 2004 where you score and it's backs-to-the-wall for the rest of the game. Of course that first game against Spain (3-3) was an exception to the rule but that's because the tempo of the game was taken out of their hands by their neighbours. The fans are all a bit bemused by the whole thing but the general feeling is that it's getting over the line that matters, not how you do it. A draw would see Portugal through from Group B and Fernando Santos isn't going to over-think things here in terms of where it's best to finish: Russia and Uruguay each pose different sorts of challenges and it's hard to say who's the tougher opponent. The 8/11 on Portugal isn't a price to take. They're simply not playing well enough to justify an odds-on price against a side who has shown lots of discipline, heart and tactical awareness. Their defence- pretty much the same one that won Euro 2016 - is pulling its weight and Cristiano Ronaldo, scorer of all four of their goals in two man-of-the-match performances is doing as much as could be expected at the other end of the pitch. But that's not good enough. Twice they've lost the midfield battle and they're neither doing the dirty work well in the middle of the park nor doing the pretty things that can create plenty of chances for their main man. Not to mention that Portugal aren't the sort of team to go out and try to win games they don't need to. The draw at 5/2 is the pick of the three options. You can get 11/8 on there being over 2.5 goals but at a slightly shorter price, it's worth going with both teams to score at 5/4. Pepe and co conceded three against Spain and were extremely fortunate not to concede against Morocco. Their midfield is being overrun and overplayed and putting their defence under constant pressure. They may not be so fortunate this time against an Iran side who will be forced to take a few risks and have shown they can cause a few problems when they go forward in numbers. Portugal generally score. Hardly surprising when they have 'you-know-who' in the form of his life and desperate to keep adding to that never-ending tally of scoring records. I thought Goncalo Guedes would have made way for Andre Silva last time out. He didn't but surely can't keep his place after a second lackluster performance. Silva in the side would increase Portugal's chances of a goal so if he's picked, that's probably good news for us and our bet on both teams scoring. I'm sorry if Ronaldo's name keeps coming up but you have to face the elephant in the room. 5/6 on a man with four goals in two games against a side who came into this tournament as one of the biggest outsiders would generally be considered a decent price. He's on all the set pieces and the whole gameplan is centred around creating chances for him. But how many chances will he get? Will he be tied down with extra defensive duties? It's one of those. Tempting but slightly fraught with danger. If Andre Silva (21/10) starts he may actually be a slightly better value price. He has a good record for Portugal. Joao Mario might chance his arm with a few runs into the box and is a good finisher. He's 5/1. This is Iran and Portugal’s second encounter at the World Cup after 2006. Portugal won 2-0 thanks to goals from Deco and Cristiano Ronaldo – it was Ronaldo’s first ever goal in the tournament. Portugal are [1.71] to win again. Portugal have won three of their four World Cup games against Asian opposition, losing against host nation South Korea in 2002. Iran are [6.4] to inflict another defeat. Iran are winless in seven World Cup meetings against European sides (D1 L6), with that draw coming against Scotland in 1978. Another draw is [3.75]. Current Iran national coach Carlos Queiroz had two spells managing Portugal during 1991-1993 and 2008-2010. He took charge during the 2010 World Cup, overseeing their biggest ever victory in the competition (7-0 vs North Korea). Over 3.5 goals is [4.7]. Portugal’s 1-0 win over Morocco last time out was their first World Cup clean sheet since a goalless draw with Brazil in 2010, ending a run of five matches without a shutout. They are [2.45] to win to nil. A win against Portugal will guarantee that Iran are in the World Cup knockout stages for the first time in their history – failing to make it out of the group in each of their four World Cup appearances. Iran are [6.0] to qualify from Group B.
Iran have never won their final game of the World Cup group stages (D1 L3), scoring three and conceding 10 in these matches. Portugal are [2.7] to win half-time/full-time. Portugal talisman Cristiano Ronaldo has scored each of his country’s last five goals at the World Cup; the last player to do so for a particular nation was Oleg Salenko for Russia in 1994 (6 in a row). Ronaldo is [1.8] to add to his tally. Against Morocco, Cristiano Ronaldo scored his 85th international goal for Portugal, the most of any European player at international level in football history, overtaking Ferenc Puskas’ 84 goals for Hungary and Spain combined. Ronaldo is [3.25] to open the scoring. Should he feature in this match, Joao Moutinho will make his 113th appearance for the Portuguese national side, overtaking Nani (112) to become the third most capped player in the country’s history, behind only Cristiano Ronaldo (152 before this game) and Luis Figo (127). Moutinho is [10.0] to find the net.